Unlike the other Lima stations which I visited in April 2000, this one is situated in the old downtown. I made a brief surprise visit, as the station happened to be located near the office of the state ombudsman whom I interviewed. In fact, the station is located inside a monastery, Convento Santo Domingo, at Jirón Camaná 170. The alternative mail address is Casilla Postal 4451, Lima 1. 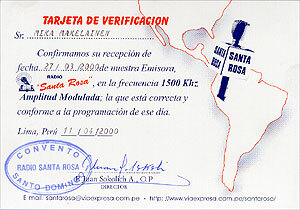 I picked up Radio Santa Rosa on 1500 kHz just two days before going to Peru. The station has been heard abroad often also on (or actually slightly off) the shortwave frequency of 6045 kHz. An employee took me to see Director, Padre Juan Sokolich A., O.P., who signed a QSL card. But a personal visit is really not necessary. The station is known to verify promptly, and can be contacted easily. The station has both a website and an e-mail address. Radio Santa Rosa was founded in 1958, and on the occasion of their 40th anniversary in 1998, a commemorative magazine, or more likely a book, on the station was published, sponsored by a couple of banks! About one third of the programming is religious and another one third traditional cultural programming. Radio Santa Rosa is a good station to begin DXing Peruvian radio stations. Not least because you're likely to get a QSL in return - and you don't need to visit them in person.